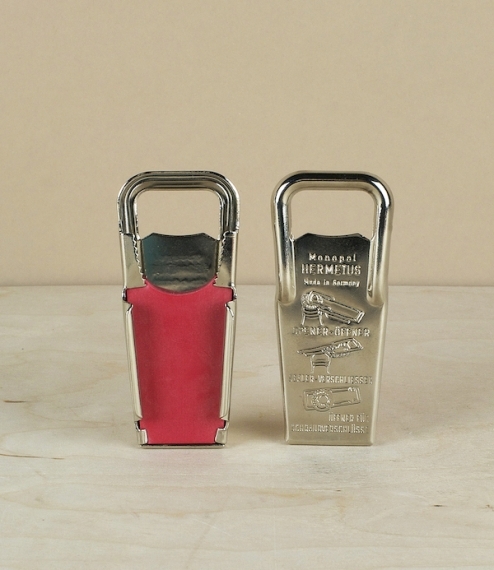 A chrome plated pressed steel bottle opener from Germany which has rather more to it than first impressions might suggest. Not only does this easily remove traditional crown caps, and assist in the removal of seized screw tops, but the cleverly furrowed rubber backed handle slips easily around the grooved throat of standard crown stoppered bottles, resealing them to preserving both their fizz and flavour. A unique design almost unchanged in over 50 years. 8.5cm by about 3.5cm.